Andrea Jolly, executive director of the Rockville Chamber of Commerce (center) at the Rockville Community Coalition meeting. At the April 5 meeting of the Rockville Community Coalition, Andrea Jolly shared that the Chamber of Commerce is becoming more active in local advocacy and that the Chamber cares as much about the community as it does business. She’s the executive director of the Rockville Chamber of Commerce, an organization that now claims 185 members, a dramatic turnaround from its nearly lifeless condition just a few years ago. As examples of their reinvigorated stature, she noted the public stand they’ve taken on behalf of Pumphrey’s; the support for environmental causes that affect the community as a whole (such as the bag tax and storm water management fees); and the sponsorship of the Rockville Economic Summit. She expressed her concerns that the community seems to be artificially divided between businesses and residents and while the Council claims to be business-friendly, their actions have indicated otherwise. Most members of the Chamber are small businesses that are locally owned and operated and rely heavily on local residents as both customers and employees. She also voiced a desire that there be good relationships throughout the community rather than irreconcilable differences–we may disagree at times, but we should always be willing to work together to solve shared issues. she clarified the relationship with the Rockville Economic Development, Inc. (they attract and retain businesses but cannot advocate; Chamber provides ongoing services to its members and the current business community, can advocate for a business-friendly atmosphere). She also mentioned that REDI may have a new executive director in place in May. Really? Do we need more taxes in this economy? Do we want to add more government paperwork to small businesses, such as barbers, interior decorators, and shoe repairmen? Tax the service that helps prepare our taxes? Tax unemployed people who are trying to get temporary job or get help from an employment agency? Really? Read House Bill 1051 for yourself–everything in bold capitals is new. Today is a double-header for the Rockville City Council candidates, putting a punctuation point to a long series of debates this season. I attended this afternoon’s session hosted at the Senior Center and tonight is the last with the Chamber of Commerce. By now, the candidates have honed their thoughts and can quickly state their positions, which is much more helpful to the voters. You can also see where alliances have formed, how their personalities affect their thinking, and where there is uncertainty. From today’s forum, it seemed the alliances are Marcuccio, Newton, Hall, and maybe Gottfried vs. Gajewski and Pierzchala (if we arranged this by nationality, we’d have. . .hmm). 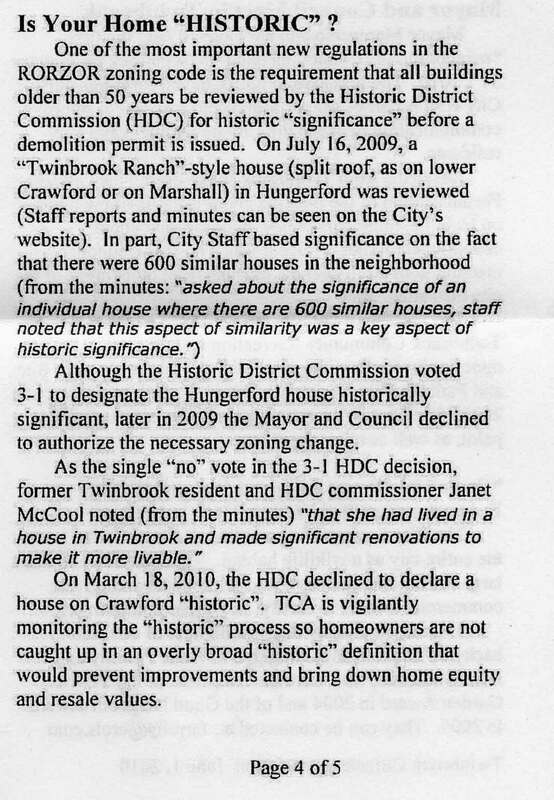 "Is Your Home Historic? ", TCA Newsletter, June 2010. On Friday, September 16, the City of Rockville hosted an orientation for council candidates at Glenview Mansion to provide a general overview of city government and its operations. Every candidate except the incumbents attended, and we received short presentations for every department head and the City Manager, City Attorney, and City Clerk that outlined the current status, anticipated challenges, and major projects. Rockville’s Taxes Too Hot? Too Cold? Just Right? Our taxes are too high. Why can’t the Mayor and Council lower the tax rate? We pay a lot in taxes. We deserve to have trash picked up twice a week. Why haven’t they fixed my sidewalk? Our taxes are fine, but why does the money always get spent on the west side of town? and so on. I’ve never heard anyone say their taxes are too low.